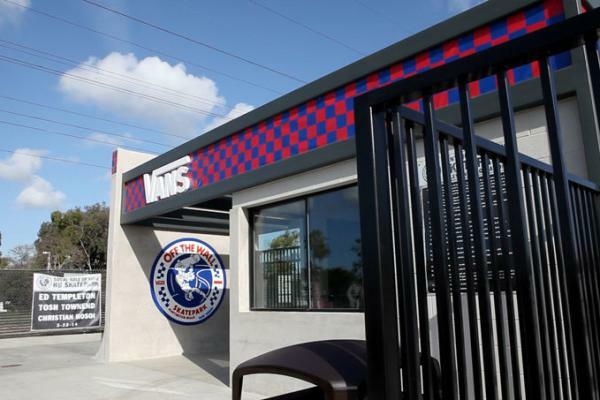 Covering a full city block in Huntington Beach, Vans Off The Wall Skatepark is a premier skate park destination that attracts novice and professional skaters to pop, carve and grind. Located behind Bella Terra and next to The Village at Old World, Vans Skatepark is open Monday-Sunday from 9AM - 8PM. 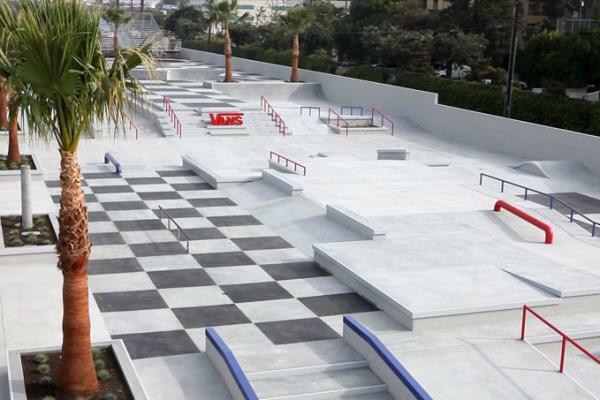 Vans founder Steve Van Doren envisioned a park where every edge that anyone can skate on is covered in metal so it can last forever. His vision was realized in 2014 when the 42,500 square foot park opened as a free park to the public with nearly three acres of ramps, bowls and stairs opened. The skate park offers every type of terrain. A 17,500-square-foot transition area includes a full-sized competition clover bowl and custom hybrid backyard bowl/flow combination. The shallow areas of the bowl help novice skaters learn the features, while deeper areas cater to advanced riders. The massive 25,000 square foot area dedicated to the street plaza is comprised of real-life street elements including stairs for jumping and plenty of metal edges for grinding. It also features a double-kinked handrail that’s more than 40 feet long and a dazzling volcano feature with a palm tree. 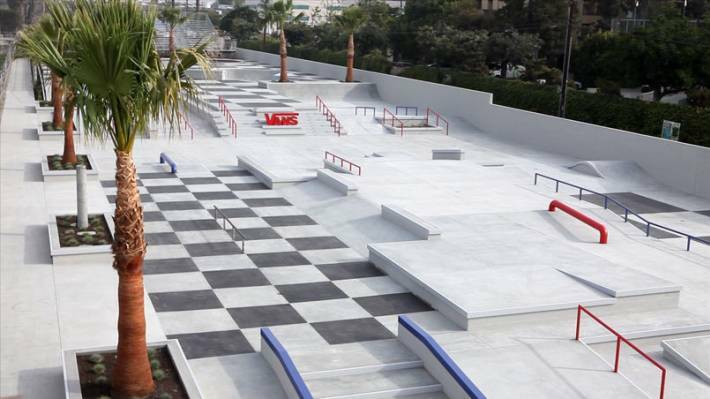 Both the upper transition area and the lower street plaza are tied together by the iconic Vans checkerboard paving pattern that weaves throughout the entire park. The skate park is complete with lights, snack bar, bathrooms, lockers and a parking lot. Jack’s Surfboards has a retail space and snack shop on site called Jack’s Garage, which sells gear and rentals for skaters and BMX riders. To end your skateday, head over to Grinderz (a skate influenced burger joint) located in The Village at Old Village, for savory burgers and fries that are as good as they look. 1. 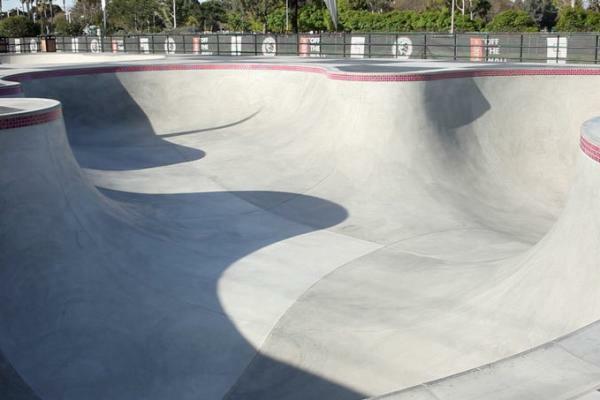 As required by California law, all participants will be allowed to enter or remain in the Vans Skatepark (the “Park”) if they are wearing full protective gear, including, but not limited to, a helmet and hard-shell elbow and knee pads. Helmets must be buckled at all times while in the Park. Participants over the age of 18 may opt to wear only a helmet and no knee or elbow pads. 3. All participants must skate/ride safely at all times and avoid collisions with other participants. Fighting or other aggressive or disruptive behavior will result in ejection from the Park. 4. No one is allowed inside the Park when the facility is closed. 5. Smoking is prohibited in this facility. 6. No one under the age of six (6) years shall be allowed into the skating area of the Park. 7. No contests of any sort are allowed in the Park unless organized and run by the Park staff. 8. No scooters, Razors, wave boards, or motorized vehicles will be permitted in the Park. 9. No lessons, clinics, classes, or camps are permitted in the Park unless done by Vans Park staff. 10. No smoking, chewing tobacco, or alcoholic beverages or drugs of any kind will be permitted inside the Park. 11. Graffiti, tagging, or defacing Vans property in strictly prohibited. 12. There is to be no photography inside the Park unless approved by Vans Park staff. 13. There is no BMX riding in the bowl at any time. Any BMXers seen riding the bowl will be asked to leave the Park. 14. No outside skate obstacles are to enter the Park without Vans Park approval. 15. No Pets will be permitted inside the Park. 16. No food or drink may be brought into the Park and participants may only consume food and drink in the designated areas. No glass bottles will be permitted inside the Park. Non skate/rider equipment or gear, and any other items, must be stored in locations outside the skate area. 17. Shirts and shoes must be worn at all times while in the Park. 18. The Park will be closed during inclement weather.